Following are test question answers for the plasma membrane and cytoplasm. Student can prepare these important question to prepare for any test. Give chemical composition of plasma membrane? Ans: Protein: 60 to 80%, Phospholipids: 20 to 40 %, Cholesterol in small amount, Carbohydrates in small amount. What was the model of E. Gorter and F. Grendel? Ans: They described that cell membrane is actually phospholipids bilayers. The hydrophobic ends of the phospholipids molecules are directed inward and hydrophilic ends of the membrane are directed outward. Gorter and Grendel also tried to measures the exact contents of plasma, but they failed. What is role of cholesterol in plasma membrane? Ans: Cholesterol is also present in the plasma membrane. The cholesterol molecules are embedded in the interior of membrane. They make the membrane less permeable for water-soluble substances. Cholesterol molecules make the membrane rigid structure. Thus, the cholesterol molecules stabilize the membrane. What are Glycocalyx? Give their function? Ans: Surface carbohydrates and portions of the proteins and lipids make up the glycocalyx or “cell coat“. The glycocalyx shows complex arrangement. They have distinctively shaped groups of sugar molecules. These sugar molecules act as a molecular “fingerprint“. The glycocalyx are necessary for the recognition of cell. So, they control the behavior of certain cells. Differentiate between simple and facilitated diffusion? Ans: The movement of molecules from the area of higher concentration to the area of lower concentration is called simple diffusion. The movement of molecules through the protein molecules from higher to lower concentration is called facilitated diffusion. What is role of carrier protein in facilitated protein? Ans: The facilitated diffusion also does not require energy. A molecule temporarily binds with a carrier protein in plasma membrane. It is transported from an area of higher concentration to the area of lower concentration. What is isotonic solution? Give its effect on plasma membrane? Ans: In this case the solute concentration is the same inside an outside the cell. For example, a red blood cell. The concentration of water molecules is also the same inside and outside the cell. Therefore, water molecules move across the plasma membrane at the same rate in both directions. Thus, there is no net movement of water in either direction. What is Hypotonic solution? Give its effect? Ans: The solute concentration is lower outside the cell than inside. Thus, the concentration of water molecules is higher outside the cell than inside. As a result, water moves into the cell. It may cause bursting of cell. Ans: The movement of molecules from the area of lower concentration to the area higher concentration by the expenditure of energy is called active-transport. Active transport takes place against a concentration gradient. This movement against the concentration gradient requires ATP energy. Differentiate between Pinocytosis and Phagocytosis? Ans: The nonspecific uptake of all droplets of extracellular fluid is called pinocytosis. Phagocytosis (cell eating). The uptake of solid particles by invagination is called phagocytosis. 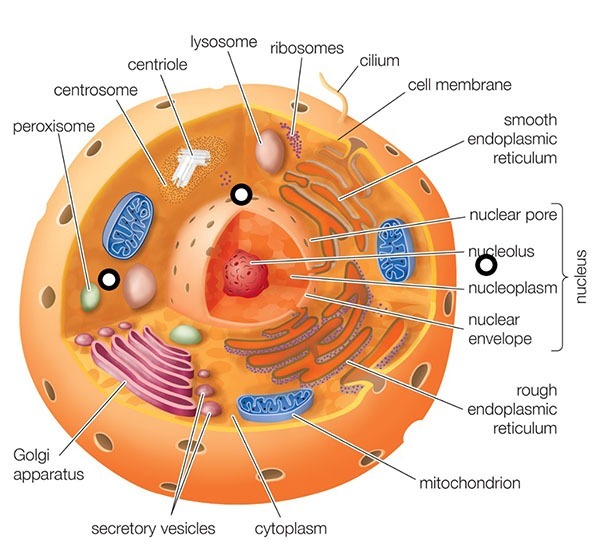 Ans: the living content of the protoplasm between plasma membrane and nucleus is called cytoplasm.